leave the country is alarming. over last year at this time. ner held recently at their home. Jerome Tiahman continues as Federation President. Jeanne Levy inducted as Chairman Women's Division. Hours 10-4:45 Mon. through Sat. of care for the elderly at the Center. ourselves, who will?" she asks. Kraft (third from left) and Claudia Morse (right). Century Village, and all over. Endowment Fund. Let us tell you how. prior to her current position. She has also traveled to Israel. will be held on Thursday, Jan.
a Demographic Study of the Jewish Population of the Palm Beaches. We are looking for individuals with clear speaking voices to do telephone interviews. Calling will begin on January 22,1987 and will continue for 4-8 weeks. All calling will take place at the Jewish Federation of Palm Beach County. and Thursday 10 AM -10 PM. Federation of Palm Beach County at 832-2120 by Wednesday, January 14! Campaign Director, at the Federation office 832-2120. Thursday, January 15,1987 3:00 P.M.
bolized by this holiday is yet a dream. Soviet Union who are denied this opportunity. suffering of our brothers and sisters in the Soviet Union. languish in Soviet Labor camps or exile. POSTMASTER: Snd address changes to The Jewish Floridian. festivities on Sunday, Dec. 28.
and dreidel games. At 4 p.m.
ty wide celebration is free. Israeli donuts will be on sale. guide is of special importance. JOIN WOMEN ON THE MOVE! Wednesday, January 21,1987 9:30 a.m.
"The New Immigrants Women on the Move"
^SXSXSf. :; ;on the move from North t0 So"th. learning to adjust to new life styles and transitions. JANUAHY 21,1967, AT THE EASTPOINTE SOUTH VILLAGE RECREATIONAL CENTER. thia year for Jews locally and in Iarael. religious-national holiday in character and origin. who prescribed the laws of the Torah. fulfilling the command to kindle the lamp with that oil. and reinstated the laws of the Torah. but still had no consecrated oil. for eight days, hence the eight days of Chanukah. 5 with host Barbara Gordon Green. 12 (8:30 a.m. WFLX TV 29) with host Richard Peritz. 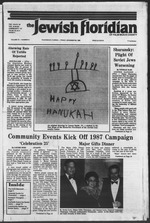 "FESTIVAL OF LIGHTS" Friday, Dec. 26, 7:55 p.m.
- WPBT Channel 2 The history of Chanukah. song with the Children's Choir. Firat Night of Chanukah Free Sons of Israel -12:30 p.m.
Golden Lakes Temple elections 7 p.m.
Yiddish Culture Group Century Village 10 a.m.
ty Yiddish Culture Group Cresthaven -1 p.m.
Jerusalem silversmith aad designer, D.
Federation events, please call 832-2120.
and volunteer are at ease. someone with a needed friend. and it's packed with goodness. Kringle Coffee Cake.... each $3"
risen steadily year after year. B'rith and Temple Beth El. way the Bronx used to be? like to tell you about it. along just fine in those days. catered to her personal needs. kept it fresh at all times. Mrs.
names and faces in those days. munity was part of us. closeness and the good vibes. ple back to the other boroughs. and to them, it is a bargain. clear that we had to have fish. out the entre, sole Veronique. three years," Mrs. Levy said. Lands of the President Committee members attend the Campaign kick-off. Green, Rhoda Weinstein, Helene Zucker and Bobette Newman. Osdin hear about the needs of the 1987 Campaign. Committee members enjoy a cup of coffee before the start of the meeting. Wolper, Helen Goldman and Ethel Atkins. nn, greets guest speaker Dora Roth. to right) Sylvia Wadler and Blanche Rich. ple of Israel," stated Mrs.
Florence and Joseph Mandel with Ambassador Netanyahu. Sydelle and Arthur Meyer with Ambassador Benjamin Netanyahu. Miles Q. and Shirely Fiterman with H. Irwin Levy. Jeanne Levy and Erwin H. Blonder with Benjamin Hornstein. Arthur and Libby Gladstone with Ceil and Robert S. Levy. to the community at a gala luncheon held at the Breakers recently. locally, in Israel, and worldwide. Beaches in the year 2011.
thanks her hard working committee. display about Palm Beach County's missions to Israel. (ngMj aa Mort Gilbert and past President Jeanne Levy look on. sale on Feb. 3, for much needed funds for medical supplies. ment Duo (courtesy of the Bank "Savings of America"). spirited presentation of music, peace, love and joy!" ed, "Molly's Pilgrim," which will be shown at 1:30 p.m.
Coffee time is 12:30 p.m.
lunch, fashion show and card party. Donation is $50. Monday, Jan. 5 at 11:30 a.m. Donation is $15. Cypress Lakes Chapter Leiaureville, Sunday, Jan.
25, Gala 75th Diamond Jubilee Celebration at 6:30 p.m.
Bal Harbour for luncheon and show, entitled, "It's Hot"
Fruchs, Edna Bienstock, or Mae Satloff. Organization Luncheon at the Airport Hilton, kosher meal. Sunrise Bank), 4645 Gun Club Rd. Book ReviajF by Irving Oblas. part of Israeli society. Mrs.
day, Jan. 15, at 12:30 p.m. at American Bank, Westgate. Mar. 4 Dinner at Bee Hive and Burt Reynolds Theatre. Mar. 31 ANS Luncheon and Card Party at Christines. For information contact Ruth Gottdiener, Chatham S-373. formers of the Actor's Repertory Co. All are welcome. '86, Dinner Black Forest. Only $250. Presentation of the Life of Maria Callas. than it has been in many years. almost 17 years," he claimed. on the issue of human rights. A registered and licensed government securities broker/dealer. This year be a little different. your holiday season one to remember. about Christians behind the Iron Curtain. small country (and the U.S.
musical selections. With her is Rev. John F.
more camaraderie at 1:15 p.m.
Stay at a hotel in Fort Lauderdak New Year's Eve. (Dec.
Ann at the Center, 689-7700, immediately. Breakwaters Condominium starting at 8 p.m., Dec. 81. Executive Center Dr., Apt 3M, West Palm Beach, Fl. Erwin H. Blonder (left). President, Jewish So* J7 Task Force Co-chairmen. plied for permission to leave the Soviet Union. for the plight of Soviet Jewry. Secretary of the Soviet Union. pant in the Soviet Union. Recently a friend of Mrs.
they received a reply from Eli. for many years to emigrate. how to express that identity. total loss of Jewish identity. with a clarity of who we are. as we shape our lifestyles. Methodist Church, 6613 Dillman Road, West Palm Beach 33413.
holidays 9 a.m., Monday and Thursday 9 a.nt. ,J&kt Dc- 26 5:19 p.m.
floor. Doors open at 11:30 a.m.
March 4 to March 7 inclusive. treat, for young and old alike. '~tion to help build every aspect of the nation's economy. [*t Sentinel Plan Chapel. Boca Raton. ties in the public schools? place in the public schools. the motto of that movement. to coordinate this event. Mrs.
from the people at Publix.